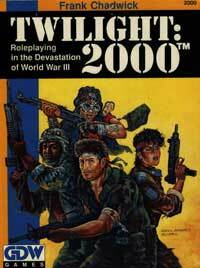 Twilight 2000 (2nd edition) Review | RPG Review Cooperative, Inc.
"Few may recall today, but in the early 1980s, the world was fatalistic and paranoid about the prospects of nuclear war. It was in this milieu that GDW released the first edition of Twilight 2000 in 1984. The PCs took the role of U.S. soldiers left in Poland after a brief limited nuclear war between NATO and the Warsaw Pact. The first edition came in two notably slim books with an equally slim game system which, whilst with its problems, was usable, and perhaps most memorable for the "Coolness Under Fire", which represented how many phases in a combat turn a character would effectively hesitate whilst bullets were flying around. The game was quite a success with a run of scenarios, although the real world engaged in its typical habit of interrupting the assumed history. By the time the second edition was released in 1990, the eastern bloc and the Soviet Union was on the way out. Nevertheless, the second edition looked representative of the game's popularity. The new book was more than ten times the size of the first edition, suggesting that significant effort had been spent in elaboration and development. Consisting of some eleven sections, the game is presented with realist shaded ink-pencil drawings and a three column justified sans-serif font throughout. It looks attractive, but is actually quite difficult to get past the wall-of-text in actual play. Page numbers are clearly marked, but not sections. There is a good two-page table of contents and an index of equivalent length. The cover art by Dell Harris is but fair in technique and creativity, suggesting a certain wildness of behaviour by the mixed-force band of PCs represented, although the ugly yellow background is distracting. I will readily admit having preference to the cover art by Steve Vetners in the first edition. Notable is the "vehicle cards" and "weapon cards", the former consisting of on average half A4 sections and the latter quarter A4. Each provides an image and summary of the relevant item. Taking up some 65 of the new pages, they are nominally designed to be photocopied and distributed to players when they have such equipment, but this use in play is marginal at best. The book itself is softback and excellently bound with a strong glue. The game begins with an official "countdown to armageddon", which shows a fair knowledge of the international geographical and politics. The cause of the official war is tensions between the Soviet Union and the People's Republic of China, and is followed up a year later by conflicts between a re-united Germany and Poland eventually leading to a NATO and Warsaw Pact conflict (yes, once again Germany re-negotiates the Polish border). You may be very surprised to discover in the game history it is the Soviets that launch the nukes first, initially tactically against the NATO forces, but with far less restraint against China. There is much I find questionable about the official history, especially the notion of a "limited nuclear war" (more on that later) but the game is only weakly tied to the official history and it does provide sufficient detail for those who want an "out-of-the-box" back story. Players determine the nationality, gender, and name of their character, followed by either point allocation or random rolls for the six attributes; Strength, Agility, Constitution, Charisma, and Education, which are rated from 1 to 10. The point allocation is 32 distributed among the characteristics; the random method is 2d6-2, rerolling results of 0, and adding if the total is less than 30. Overall, this gives a slightly unbalanced advantage to the random method. Attributes are used to generate derived values such as hit points (allocated on a per location basis), carrying capacity, throwing range, and as core influence on unarmed combat damage. For their initial background, characters choose 4 skills at level 2 from a short hobbyist list. They are now considered 17 years old. Following this there is a range of 4-year term careers in civilian and military occupations with a notable, and acceptable, emphasis on the latter, although an "Athlete" civilian profession would have been nice. Characters pick up skills in each profession and term, with military careers varying slightly according to nationality. Soviet soldiers receive less basic training to their U.S. counterparts, but the British receive even more! Nationality also determines the possibility of a character having multiple languages; by default each character receives a native language at skill rank 10 (effectively 100%), but with a d10 roll for other languages also starting at rank 10. U.S. soldiers, for example, have a 2 in 10 chance of all speaking Spanish as native, and if that fails, a 1 in 10 chance for German, or Italian, or Polish, or Yiddish. With the exception of the Ukrainians and Byelorussians who also speak Russian, other Soviet nationalities speak their native language alone. Skill ranks bought in a related language count double, but Europeans count all other European languages at double value as well. Let's face it, the British are the multilingual killing machines in this game. In each professional term characters have the opportunity to gain skills, promotions, contacts, and pick up a secondary skill. The skill list itself has somewhat of an action rather than knowledge focus, with around fifty skills plus specialisations. Despite being allocated in groups with an attribute, skills levels show no attribute influence. At the end of each term a die roll determines whether war has broken out, resulting in one more term under such conditions. This does mean that starting characters will start anywhere from a minimum 21 to a theoretical starting age of 53; most will be in their early to late 30s. Characters have the potential to lose attribute ratings due to age from the 33 (Agility) onwards. Military PCs start with a number of background rads equal to the terms served (in peacetime or otherwise) in d6s. Civilians start with a significantly higher 1d6*1d10. Characters, in groups of three, can also pool together to acquire a vehicle or an equivalent number of animals. One very interesting rule is the ability for players to use contacts as plot devices, an early example of narrativist thinking. Finally, Initiative is based on service; regulars receive 1d6, reservists 1d6/2 (round up), draftees 1d6/2 (round down), +1 for some military professions, -1 for others. This will determine the order and actions per combat turn; it is very extremely important. Starting equipment is tied to government issues (so the French are likely to have an FA-MAS, the Soviets an AK-74, U.S. troops an M16, etc). There is, as can be expected, quite an emphasis on guns, bullets, military vehicles, and heavy rounds, but there is also a modest collection of related travelling equipment such as stills (very important for fuel), generators, heaters and coolers, tools, range finders, medical supplies, and personal gear. Character's starting gear is based on the number of military terms they have served, with even nominal civilians picking up one term. Something that is quite notable in the equipment list, especially in the 'cards', is the number of abbreviations most of which is quite unnecessary given the availability of white space. If it seems a little odd to discuss setting information at the point that's because this is what the game does, as part of The Referee chapter, immediately after heavy weapons equipment. The recommendations for describing the world are very sound, as is the advice for game structure and novices. The skill and task resolution system on the other hand could have been subject to some more careful consideration. The method is simple enough; a d10 roll under the appropriate "asset" (skill or attribute), with difficulty levels acting as a multiplier or a divider to the asset score. This effectively means that characters with a low skill level, even with an easy task have very little chance of success, whereas characters of average skill will find the tasks increasingly trivial. There is some sense of degrees of success with critical levels at plus or minus four. About two pages describes default skills challenge examples, which is useful. The game then moves to some more setting information, specifically non-player characters, with a small number of stock NPCs (militiaman, hermit, refugee, farmer, soldier, marauder), some examples of contacts, and an NPC motivation system based on card draws. Time and Travel makes up a chapter, with the game days split into four hour periods, with environment and encounter tables, food requirements and fatigue issues. The encounter tables distinguish by terrain with three broad categories; human groups, major items, and animals. The group encounter statistics table slips into first edition notation with Observation skills being listed at ten times what is normal for this edition! Each potential encounter is given around a paragraph or more of description, and there are over twenty pages of detailed floorplans for encounter locations (.eg., a farmhouse, a subway station, etc), although these are somewhat heavy on the white-space. Combat is carried out on an interior 2 metre grid or an external 8 metre grid with diagonal modifiers. The thirty second combat turn in broken up into six phases of five seconds each. A character's Initiative determines on which phase they initially act and all subsequent phases; so an Initiative 6 character acts on all phases, whereas an Initiative 1 character only acts on the last phase. Characters with a lower initiative act first in the phase, with Agility minus weapon bulk determining ties. Wounds also effect initiative. Regardless of Initiative, characters may repeat actions in continuing phases. Characters who are surprised or suffer particular combat effects may also Panic, if a 1d6 roll is greater than their Initiative. If it is, they freeze then go prone for a number of combat phases that the roll is greater than their Initiative. Overall, the system gives very significant advantages to characters with a higher initiative. Armed and unarmed combat is based on a d10 roll under the relevant skill, with the option for the opponent to block and abort an action in a later phase. Attacks may be aimed for specific locations with a Difficult skill divisor. Armour subtracts from damage. Grappling cannot be blocked, nor does armour protect, instead the damage is applied to the opponent's Strength; when this is exceeded the opponent is "controlled". One particular rule which stood out was automatic hits for armed and unarmed melee with automatic choice of location. Fire combat is differentiated into direct and indirect, with indirect fire having hit chances based on attacker and observer. Guns have a reload and rate-of-fire rating which determines the number of shots per phase, although every shot after the first counts as a "quick shot" with a divisor. Semiautomatic weapons may be fired up to five times per phase. Automatic weapons fire with a typical rate-of-fire per burst, noted on the weapon card (for example, the M16A2 can fire either five shots per phase or five three-round bursts). For automatic fire, roll a pool of d6s equal to the number of rounds in the burst, with each 6 indicating a hit. It's a good way to waste ammunition and roll a huge number of dice, taking up time. Range is defined as close. medium, long, and extreme for each weapons with an easy multiplier at close and difficulty divisors at long and extreme (e.g., the M16A2 is considered "close" at 55 metres of less). Weapons also have a recoil number which, when exceeding Strength from single-shots or bursts, reduces hit chances. Explosive damage declines from point of contact. Damage is based on a number of d6 dice. Weapons have a penetration value which may bypass armour; multiply the target's armour protection by the weapon's penetration value and subtract the result from the the weapon's damage value. Aimed shots which hit the chest or head may kill, based on a d10 roll under the weapon's modified damage value. A character is stunned if they receive more damage that their agility, and stunned if hit to the head. Wounds are considered slight if hit points are still positive, serious if greater that than the hit points, and critical if twice the location's hit points. Critical wounds are immediately fatal if scored to the head, and usually so otherwise. Characters without medical assistance will recover from slight wounds in three days, serious wounds in several, and assuming it is stabilised, critical wounds in two. There are fairly extensive rules for various forms of chemical munitions, mines, infections,, and tactical visibility, all of which are presented in a manner that is both case-specific and realistic. Several pages is dedicated to vehicles, maintenance, vehicular combat, animals and boats. Of particular note is the consumption rate of fuel per four-hour period with various multipliers for the types of fuel. After a very quick experience with ethanol, characters will quickly realise that this is only for emergencies and will actively seek out petrol instead. The example of the M1 is illustrative; it has a fuel capacity of 1920 l, and a consumption rate of 550 l per four hour period. Petrol has consumption multiplier of 1, methanol of 3.5 . In other words, a tank of methanol will last less than four hours; a tank of petrol almost fourteen. An average person can gather one hundred kilograms of vegetable matter to make methanol per four hours; this will produce about 44 litres of fuel, requiring the equivalent of five and half days of collection for a single four-hours worth of capacity. The text then jumps back to setting, providing a description of the world in 2000, albeit with a heavy emphasis on Poland where the default campaign is set. Following the collapse of government currencies the general medium of exchange is gold in city environs, barter outside of that. The limited scale of the nuclear exchange is evident by the fact that significant cities are still in operation, notably Lodz and Krakow (the second and third largest cities). There is a detailed listing of the U.S., Canadian, British, and Soviet nuclear targets, along with a description of the effects of radiation illness and a delightfully realistic listing of diseases. Concluding the game is a price list, twenty pages of charts and tables, and four pages of designer's notes summarising the major rules changes from first edition and their reasons. Twilight 2000 (2nd edition) comes with a tolerably bad set of rules in a tolerably bad setting. Major candidates for reform in terms of rules include professions (scope and content), skill modifiers, influence of attributes, initiative, automatic fire, and armour. Whilst this does make a substantial section of the game, a GM who wishes to run this game should give serious consideration to making tweaks and modifications to the rules-as-written for these sections; but with a little bit of consideration they will find that a little bit of effort will create rules that are more streamlined, more realistic, and with greater consistency. Major candidates in terms of setting includes the effects of a limited nuclear war. It must be said, like many U.S. assessments of such a conflict, it is seriously underrated; if you have the stomach for it compare Threads (UK) to The Day After (US). An unlikely limited nuclear war, which means that large areas of industry are still in operation and very significant areas of the globe is relatively untouched. The claim that these circumstances leads to a political and communications cantonment system using gold as currency is far less likely than commonly supposed. What is more difficult to fix is the presentation of the game. The ordering of the book, the font choice, the chapter notations - all represented by the "layout" score - is a major drawback. The context-free artwork is good in terms of technique, but lacklustre in terms of creativity. Where the game does shine is in the strength of physical product itself, but more so in the scope of the material that game presents. (For evaluation purposes I have considered the equipment cards to be just that, rather than part of the rules as such - otherwise the "text" rating would be less). Overall however this is a slightly below average game for the reasons provided.